Specializing in the treatments of neuromusculoskeletal disorders and injuries that include neurological conditions as well as the spine, joints and sports injuries. Chiropractic treatments provided in an integrative setting through a clinical chiropractor and physiotherapist will yield better results. The profession of chiropractic and care from a clinical chiropractor is relatively new to Malaysia. Over the years, the chiropractors and physiotherapists of Chiropractic Specialty Center® provided corrective treatments for neck pain, back pain, slip-disc, joint, and sports injuries as well as neurological disorders (stroke, MS or Parkinson’s disease). In our centers, chiropractic is practice through holistic principles. In other words, we offer diagnosis specific focused treatments to restore balance and improve function. We accomplish this by identifying weakness and correcting them through chiropractic, physiotherapy, rehabilitation and advanced technology. Our Doctors of Chiropractic practice hand-in-hand with our physiotherapists who use state-of-the-art technology when they treat spine, joint or sports injury. If you live in pain or have lost mobility and function, we can help. We have succeeded when others have failed. Contact us today for research-based clinical systems of Chiropractic and Physiotherapy for healthy active life. Why Should You Choose our Chiropractors and Physiotherapists? By definition, a curve has to be greater than ten degrees for it to be classified as scoliosis. Diagnosis of a scoliotic spine is based on the age of a patient diagnosed with a scoliotic spine. Adult Idiopathic Scoliosis is descriptive of abnormal spinal curves in those aged 18 years or older. In our center, we offer scoliosis treatments through chiropractic, physiotherapy and advanced technology. Adolescent scoliosis is descriptive of curves in those between 10 and 18 years of age. Juvenile Idiopathic Scoliosis is the term for the same condition in children aged 4 to 10. If the patient is under the age of 4 years, the most appropriate descriptive term is Infantile Idiopathic Scoliosis. Chiropractic and Physiotherapy can be of significant help. Chiropractic care from us is enhanced with clinical physiotherapy and advanced technology. Therefore, the care you get from our chiropractor and physiotherapist will get you better faster. Juvenile Idiopathic Scoliosis (JIS): is seen in 15% of cases and associated with progression in approximately 70% of these cases. According to most published literature, 50% of Juvenile Idiopathic Scoliosis patients may require some form of surgical intervention. However, we encourage all parents to visit us before contemplating any degeneration of scoliotic surgical procedures. Chiropractors and physiotherapists at our centers can help even if the surgeon recommends surgery. Therefore, it is incumbent on parents to have their kids checked to ensure a timely and accurate diagnosis before initiating care. While our Chiropractic system of care is not for infantile cases, we do treat Juvenile, Adolescent and Adult Idiopathic Scoliosis patients. Scoliosis is commonly diagnosed during adolescence. Efforts are being made to identify the cause, but unfortunately, there has not been an acceptable theory. However, there are varying opinions about potential causes or exacerbation, including but not limited to hormonal imbalances, asymmetric growth, and soft tissue imbalances or weakness. Scoliosis treatment differs when compared to care rendered for neck pain or back pain. The typical neck or back pain patients may benefit from general mobilizations, exercises, and stretching programs. However, when it comes to a scoliotic spine, care must be condition specific. A scoliotic spine is one where the spinal bones have rotated and tilted. The challenging part is that the rotations and side endings are on the opposite side. Moreover, those with two curves (double scoliosis or “S-shaped” scoliosis) are even more difficult to treat. If the care you get is not targeted or corrective, it worsens the rate of progression. Chiropractic Specialty Center® was one of the first centers in Malaysia to incorporate clinical physiotherapy with research-based chiropractic (Kiropraktik in Bahasa Malaysia). Corrective non-surgical scoliosis treatment is the best means of treating scoliosis. Chiropractors and physiotherapists have treated patients with scoliosis successfully. However, it is not just the chiropractor of physiotherapists that gets you better, but the methods and systems they use in treating you spine holistically. Published research in the BioMed Central revealed the benefits of corrective Chiropractic and Physiotherapy for scoliosis. The authors of this multi-patient case study reported 17-degree improvement following manual procedures for patients. In short, the snowball research-based collaborative treatment you can get from us will get you better faster. The goal is to get your spine and soft tissues (muscles and ligaments) stable as soon as possible. The process starts with a thorough assessment. A clinical chiropractor thoroughly assesses and records his or her findings. They evaluate your muscle and ligaments for strength and flexibility. The muscle and ligament assessment potion are not just for the spine, but also for the upper and lower limbs. In addition to the soft tissue examination, they evaluate the weight-bearing and non-weight-bearing joints, as well as the spinal discs and nerves. Every scoliosis patient is required to have scoliosis specific x-ray. So, if you have a recent x-ray, bring them for a comprehensive assessment. To conclude, the expert level of attention and care you get from clinical teams of Chiropractic Specialty Center® is second to none. As such, we get results even when others fail! Scoliosis curves increase rapidly during early growth (puberty). The potential for progression or worsening is best evaluated by considering age and observing radiological signs (X-ray parameters). The onset of the first menstrual cycle for the female adolescent is also a critical factor that should be studied. Typically, girls grow until the age of 14 years, and boys continue to grow until they are 16 years old. Girls rapidly grow until the second year of their menstrual cycle. After the 2nd year of the menstrual cycle, the growth may slow down but can continue until the age of 18. To avoid rapid progression, initiate treatments as early as possible. Stabilizing spinal curvature is difficult, but it can be successfully treated. As mentioned, scoliosis can progress throughout life. Therefore, adults with moderate curves need urgent attention. The adult scoliosis is also known as degenerative scoliosis. In other words, it is a scoliotic condition that worsens with the advancing of age (degeneration). Call us today to learn more about your non-surgical options. Chiropractic Specialty Center® offers the best non-surgical scoliosis treatment in Malaysia. Back Pain is the most common health problem in the world today. It is the number one cause of disability in persons under the age of 45. Back pain is a problem, yet many ignore it. The Chiropractors and physiotherapists of Chiropractic Specialty Center® are amongst the best in Malaysia! If you suffer in pain, visit them. They can provide treatments and targeted exercise programs for back pain and slipped disc. Our clinical non-surgical experts are capable of treating even the most severe back pain or neck pain. The care you will receive from us is through collaborative means enhanced with breakthrough neck or back specific technologies. In short, you get better faster! If you live with neck pain, you will need an expert non-surgical clinical team. The neck pain treatment protocols provided by our teams include focused and tissues specific neck pain exercise programs and treatment. It is targeted, focused, holistic and superior to what others offer. Back pain treatment is similarly better! Back pain and slipped disc treatment are provided collaboratively by spine specific technologies that fix and repair the actual cause of pain. Moreover, the back pain exercise programs you get from us are customized to meet the therapeutic needs of each patient. Don’t settle for the second best. Even if you suffer from tailbone pain (coccyx pain or coccydynia), we have the perfect treatment program for you. The coccydynia or tailbone treatments will get you better without surgery or injections. Like the neck, the back can produce varying levels of pain. Some could be mild while other types can be debilitating. Back pain has been a common cause of many health problems including erectile dysfunction in men. The nerves that exit the lower portion of the spine control and innervate every tissue in our abdomen, legs, feet and toes including our reproductive organs. Visit our Chiropractor and Physiotherapist to learn how you can bet back pain without drugs or surgery. We are the ONLY non-surgical center in Malaysia that has proven slipped disc treatments, backed by serial MRI examination. Visit us today to discover clinical excellence in the non-surgical fields of spine care. Back pain during pregnancy is widespread. Published medical research reports as many as 75% of expecting mothers to have back pain during pregnancy. Unfortunately, most live with the pain. The good news for all expecting parents is that we can help. The targeted system of back pain treatments in pregnancy is world-class at the Chiropractic SPecialty Center®. We have the clinical non-surgical experts to assess and treat you without side effects or discomfort. You no longer have to live in pain or take the harmful medications often prescribed to expecting mothers. Best of all, the care we provide is relaxing, soothing and targeted. You and your baby are in good hands with our clinical experts. Visit us today and discover the best holistic back pain treatment for pregnancy in Kuala Lumpur, Malaysia. Back pain during pregnancy often starts in about the fourth and fifth months of pregnancy. Often, the pain lingers. For most, it becomes severe in about the seventh or eight months of pregnancy. Don’t wait; let us help you recover as soon as back issues are present. Our clinical teams of Chiropractors and Physiotherapists utilize conservative, but yet extremely efficient methods of care for expecting mothers. Opt for manual procedures, as well as physiotherapy and chiropractic treatments that are safe. We have the best male and female chiropractors and physiotherapists in Malaysia. They are ready to help expecting mothers live a healthy active life during pregnancy, call us today. Contrary to the common believe back problems do not always cause discomfort. Some types of back issues cause symptoms at sites that are distant from the spine, making diagnosis difficult. For example, some patients with back problems could develop digestive disturbances, bowel, and bladder issues. Our centers have the expert chiropractors you deserve to diagnose and appropriately treat your neck pain and back pain accurately. Our non-surgical method of spine care is advanced and rendered through the best efforts of a research-based multidisciplinary team. In other words, our system of care through technology and chiropractic can help you recover faster. So, before opting for spine surgery contact us. Spine surgery failure rate is higher than previously taught. In fact, according to a recently published report, surgical failure in spine fusion is as high as 74%. The topic of spine surgery is in-depth, as such, we are not able to cover the types of surgical interventions or their likely outcomes here. But, we have a detailed article on spine surgery. The best advice we can offer those thinking of getting spine surgery is to visit us and discover your alternatives to spine surgery (laminectomy, discectomy, nucleoplasty or spinal fusion). Our methods have helped many that have failed to improve with surgery. We can help you avoid spine surgery! Sciatica is more common than most realize, here in Malaysia. The Chiropractors of Chiropractic Specialty Centers are experts at diagnosing neck and back issues. Therefore, if you are suffering from neck or back pain, our research-based chiropractic treatments, and physiotherapy is your best non-surgical option in town. The layperson usually refers to sciatica as a diagnosis, when in fact; it is a descriptive term that refers to a group of symptoms. Not to fear, our unique blend of Chiropractic and Physiotherapy that makes up NSD Therapy® is your best defense against sciatica, in Malaysia. In Short, they get results through chiropractic and physiotherapy when others fail. Each of the above can lead to sciatica. The term sciatica means inflammatory changes present in the sciatic nerve. It does not describe what type of a condition caused the inflammatory disorder within the nerve. To conclude, it is imperative to establish the cause before care. When you visit one of our centers, we may use the term Sciatica, but we use it correctly. Our clinical teams will provide you with a detailed explanation as to the cause of your sciatica. The goal of your chiropractic and physiotherapy treatments are to get you better faster. Because, the longer you go on suffering in pain, the more likely an increase in the severity of damage. Therefore our practitioners will not take shortcuts or speed you through the consultation to get to the next person. Neck pain is becoming the number one health issue today. Regardless of how tough you think you are neck problems can be tougher. Unfortunately, here in Malaysia, many that seek our help do so as a last alternative. While this is okay, we prefer to be the first and not the last option for people. It is so much easier to fix a mild condition versus one that has progressed for a long time. Chiropractic treatments combined with physiotherapy and advanced spine technology can help correct and repair even severe neck pain. That is why Chiropractic physicians always recommend early diagnosis followed by targeted treatments. Technology, clinical physiotherapist, and a research-based chiropractor are still better to other forms of care you get. In Short, we offer faster recovery. The first step towards recovery is to stop abusing your smart device. Limit your time on it and seek our assistance to undo the damage done. Neglect of even a minor condition or problem in your neck can lead to premature wear and tear. There are many types and forms of neck pain. Some are serious while others are self-limiting. The self-limiting forms occur and never come back. However, the dangerous ones come and go over and over until they come and stay. The severe neck condition is like an unwanted relative, whether you like it or not it will be there! Therefore, these are the ones to avoid. To avoid them, you must get care from our chiropractor as soon as possible. Otherwise, you risk developing a more severe condition such as a slipped disc. Neck disorders that lead to headaches or that which run down to the shoulders and arms are dangerous in that it could be due to a slipped disc or a hidden more severe condition. The worse type of neck problem to have is that which accompanies weakness in hands and arms. Upper back pain and burning sensation in the upper back or shoulder is also of concern. Weakness in extremities, numbness and tingling sensation in the arms, hands legs or feet are serious health issues that respond well to our methods of Physiotherapy and Chiropractic. Numbness, tingling, and weakness are symptoms associated with a Slipped Disc. Hence, the sooner we start your neck care, the better. Therefore, call us today and start your recovery without surgery. The dangerous kind is one that hits the left side of the neck, left shoulder, left chest and left upper back as it may involve the heart. Regardless of type, neck issues must be evaluated and diagnosed correctly for therapy to be effective. Some go to centers that have no form of training other than pushing here and there. Pushing, poking, prodding is not therapy. Therapy is therapeutic only if a condition is correctly diagnosed. For better results, have your treatments from collaborative, qualified team chiropractors and physiotherapists. Slip-disc in the neck (slipped disc) is a highly prevalent condition all over Malaysia. The use of mobile devices has made neck pain critical to the point that many run the risk of paralysis. Slip-disc is not new, but our habits and addiction to technology have propelled the slip-disc to greater heights of clinical importance. Smartphone abuse is on the rise. Limit your time on smart devices and get care from experts to undo the damage there. This way you can ensure a better future for yourself. Call any of our centers; we are ready to help. Numbness and tingling are signs of nerve damage or nerve irritation. If you have either one of these, get help. We have seen many Malaysians that had numbness and tingling, and yet their healthcare provider was not able to diagnose their condition or assist them in. Numbness and tingling sensations need fixing quickly. Neglect and procrastination will only lead to further damage. Nerves are sensitive structures and any harm, or potential problems must have a thorough evaluation to avoid nerve malfunction and nerve pain or worse: disability. Our non-surgical team is the experts in Malaysia. Call us and discuss your health issues. We are ready to lend a helping hand. Assistance is just a phone call away. We have treated thousands of patients with headaches successfully in the past. Our methods of care have been effective and helpful in more than 90% of headaches and migraines cases seen by our collaborative teams. Research has shown the cause of headaches and migraines is closely related to vascular conditions. The nerves that exit the uppermost aspect of the neck innervates the vessels supplying blood to the brain. Once these nerves are irritated (pinched), the blood vessels that they control can be affected. The chiropractors of Chiropractic Specialty Center® practice modern chiropractic, meaning they utilize technology and research-based methods of when treating you. Furthermore, the chiropractic technique used is through an activator: allowing for more precise chiropractic adjustments or treatments. The cornerstone of our successes lies in our ability to accurately diagnosing a patient’s condition. When it comes to headaches and migraines, finding the cause is critical for successful outcomes. Headaches or migraines that arise from vascular disorders are common. Call and speak to us and learn how we can help you. We succeed even when others have failed. The Therapy devices and technologies that a Chiropractic Specialty Center® are superior to other centers. Our Advanced Spinal Decompression Therapy device is second to none. The results we achieve for the slip-disc patients is better than other methods. Aside from advanced skills and knowledge, breakthrough spine and joint technology is the main reason why we succeed when others fail. Technologies such as the RxDecom® (Advanced Non-Surgical Decompression Therapy Device), Flexion/distraction, DTS Traction, ESWT Shockwave Therapy, Intermittent full spine traction, ultrasound, and electro-stimulation are utilized to help reduce pain and swelling. Additional braces and supports may be prescribed to relieve pressure on your spinal joints. RxDecom® is a state-of-the-art decompression table explicitly built to treat neck pain, back pain, scoliosis, sciatica, spondylosis and Slip-disc (herniated-disc, protruded-disc, prolapsed disc or slipped disc). Treatments on the RxDecom® are non-invasively, as an alternative to back surgery for our patients in Malaysia. 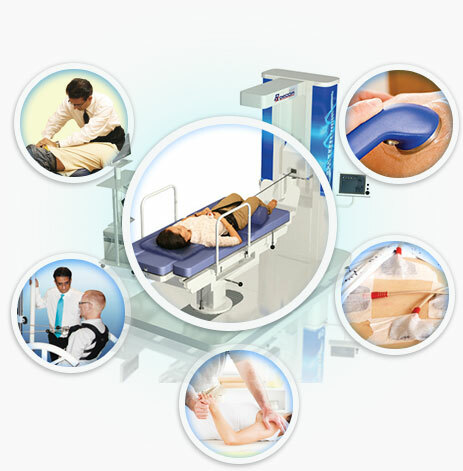 The RxDecom® is the best and most advanced form of Spinal Decompression Therapy in Malaysia. These include but are not limited to conditions arising from a herniated disc, protruded-disc, extruded-disc (Slipped disc or Slip-disc), arthritis or disc degeneration. The treatment is pain-free and quite relaxing. Many patients fall asleep during their time on the RxDecom® table. RxDecom® is the ONLY spinal decompression device that customizes each treatment to the patient‘s condition based on their age, weight, height, diagnosis, the severity of a disease, general health and much more. So, it is the most advanced, unique and smartest form of spinal decompression system in Malaysia and the world today. With our success rate of over 95%, we have been able to help numerous suffering individuals to return to everyday activities without having to live in pain. Spinercise® is a single muscle strengthening machine that can focus resistance on specific, isolated muscles. With the assistance of our clinical team, it is a vital part of our regimen which aids patients with the rehabilitation of spine and joint injuries and disorders. Using a specially designed harness, the patient performs a specific number of repetitions for the affected area. The Spinercise® was developed to deliver non-linear resistance as it assists recovery without straining sensitive vertebrate and joints, a needed component for improvement in patients diagnosed with runner’s knee pain, scoliosis, knee osteoarthritis, slip-disc (slipped-disc), frozen shoulder (adhesive capsulitis) or spondylolisthesis. FD-3000™ is another one of our advanced therapeutic devices that complements other procedures performed by our methods of chiropractic in Malaysia. In our centers, FD-3000™ is used specifically to target the spine. FD-3000™ is used to treat numerous conditions that affect the neck, upper back or the low back. Spine conditions such as scoliosis, back pain, sciatica, neck pain, arthritis and spondylosis have responded well when treated through the FD-3000™. Additionally, herniated-disc, protruded-disc, extruded-disc, bulging disc (which are collectively referred to as “Slip-disc” or “slipped disc”) and degenerated disc patients have had significant improvements in symptoms. Patients find this procedure soothing as it involves gentle motorized flexion and distraction of the spine. At the Chiropractic Specialty Center®, we use condition specific methods of hands-on treatments. Unlike others, the hands-on techniques of treatment you receive in our centers is specifically targeted to enhance the effectiveness of other services and to speed up the pace of your recovery. There are hundreds of muscles, ligaments, and tendons in the human body and our professional physiotherapists will ensure that your treatments are specific and targeting your unique condition. Therefore, the hands-on treatment you get in our centers is diagnosis specific and highly focused. As a direct result, you get better faster when we treat you. The manual therapy (Hands-on Methods of Treatments) you get in our centers is rendered either by our physiotherapists. Our clinical teams have refined our manual methods of care, and the results speak for themselves. When our method of manual systems of treatments is combined with other procedures, the efficacy is unmatched. Our means of care is not through the so-called “one size fits all,” but instead through a thoroughly researched, evidence-based procedures and techniques as employed in all systems, which also includes manual therapy. Patients with greater trochanteric pain syndrome (GTPS) and baker’s cyst will benefit from our targeted methods of manual therapy. We go beyond traditionally rendered methods of care. We are not just a chiropractic center, but also a full physiotherapy center. The treatment technologies in our center are superior to what other physiotherapy or chiropractic centers treat pateints through. The combination of muscle strengthening programs, specialized therapy devices, physiotherapy and rehabilitation provided at a Chiropractic SPecialty Center® are the critical factors in clinical non-surgical successes that others fail to achieve. Treatment with ultrasound is just another element of our regimen that helps to enhance the rate of recovery. It also plays a significant role in preventing recurrences of injuries. Unfortunately, most centers misuse this device, as the therapy must be rendered appropriately to the individual condition. Rest assured; we have world-class facilities with a professional staff that has successfully treated thousands of patients in Malaysia. Another critical element in the treatment plan, Electrical-Stimulation is ideal for assisting in strengthening the affected area without moving or aggravating painful joints. Although it has a daunting name, it provides a wonderful amount of pain relief. After a 20-minute session on our interferential current device, you will feel the difference as it helps to stabilize and strengthen at the same time. This is a big favorite among our patients here in Kuala Lumpur. The spine, joint and sports injury treatment you get in our center are enhanced with advanced therapy devices such as shockwave therapy. Shockwave therapy is an effective treatment for the knee, trochanteric bursitis of the hip, shoulder impingement syndrome, and hip osteoarthritis when coupled with chiropractic and physical therapy. Conditions such as knee pain, shoulder pain, elbow pain, hip pain, bursitis, and tendonitis respond well to focused research-based methods of shockwave therapy. Also, we found shockwave therapy helpful for patients with adhesive capsulitis or frozen shoulder. So, if you suffer from joint pain, spine conditions or sports injuries, visit us today for comprehensive treatment options enhanced with advanced technology. Chiropractic Specialty Centers® are heads and shoulders above the rest. We offer effective complementary and alternative procedures coupled with clinical physiotherapy not provided by others. We are always updating our staff with the most current research and training methods so they can better serve the public. Therefore, our practice of Chiropractic and Physiotherapy is second to none. Through our targeted means of care, we often get results when other centers fail. Visit one of our centers today for the best spine and joint treatments in Malaysia. Our Kula Lumpur Center in Damansara Heights was our first center launched in 2007. Valencia Sierramas Center in Sungai Buloh is closer for those living in Bandar Sri Damansara, Bukit Rahman Putra and Kepong. When you visit one of our chiropractic and physiotherapy centers, you will immediately notice the difference between others and us. Technologically speaking, RxDecom® is our premier therapy device when it comes to spine related disorders. Disorders such as scoliosis, pregnancy back pain, slipped disc (slip-disc), neck pain, acute knee injury, TMJ pain or back pain, even those that have had surgical procedures can be treated successfully in our centers. The treatments used in our centers can help you recover faster. We are Malaysia’s best spine and joint treatment center. Our clinical team chiropractors and physiotherapists will oversee every aspect of your care. The combined efforts of these two great non-surgical experts are far superior to the efforts put forth by either one. Our advantage is not just in our collaborative methods of care, but also our technology. The combination of a knowledgeable multidisciplinary clinical team and technology has yielded successes that would not have emerged otherwise. We measure success through achievements. Our accomplishments in the field of spine, joint and sports injuries are testaments of our clinical excellence. Whether you have scoliosis, neck pain, back pain, and knee pain or hip pain, Thoracic Outlet Syndrome, or Ankylosing Spondylitis, rest assured that our research-based clinical teams are the best in Malaysia. Our methods of neck pain, back pain and scoliosis classification and scoliosis treatment options is the most comprehensive therapy program you can hope for in Malaysia. How to become a patient At the BEST Spine and Joint Treatment Center in Malaysia? Chiropractic Specialty Center® is the premier spine and joint treatment center in Malaysia. The easiest way to become our patient is to call us. If you‘re the curious type, email us with your questions or concerns. We appreciate the opportunity to field questions. Clarify any health problems before you visit one of our centers. You may also call our main center at 03-2093 1000 here in Kuala Lumpur or any of our branches listed on our contact page. If you are the cautious type, read some of our published articles. Our articles section will provide you with additional information about our services and clinical successes. Call us and ask to speak with one of our clinical team members. Once you get them on the line, talk to them about your health concerns. We are here to help as many as possible in their quest for a healthier life. Although we prefer appointments, we will also accept walk-in patients. Please do keep in mind that if you decide to walk-in, we may have you wait for a bit. Patients with appointments scheduled will have priority over walk-ins. But if you walk in and have ONLY a question, let our front desk person know, and we will get one of our experts to answer your question. Our chiropractors and physiotherapists are the best. We have a very stringent recruiting policy and once we identify a qualified individual. Our clinical staff is enrolled them in our training course. They only join our team with their successful completion of our training program. We are very methodical when it comes to therapy and diagnosis. You will notice that when you step into a Chiropractic Specialty Center®. You don‘t need a referral from a medical doctor or anyone else to begin care. Our knowledgeable staff can field most questions over the telephone or when you come to your first appointment. We make the process of getting physiotherapy or chiropractic care from the best physiotherapists and chiropractors very easy.